Let me take you back to the evening of 27th of February 2012. My backpack is packed, the next morning I’m leaving to India for the first time, all by myself. I’m super excited but also super nervous. I’m so nervous that I actually start to feel like I have a fever. My mind is trying to convince me to stay at home and to not make this journey I have been wanting to make for so long. I can’t sleep, I toss and turn, why did I want this again? Why am I stepping on an airplane tomorrow that will take me far away from the safety of home, my family and friends. Why am I getting on an airplane taking me to a part of the world totally unknown to me, all by myself? I breathe deeply and I reconnect to the reasons why I want to do this. In February 2012 I felt I was at a turning point in my life. The year before I had started my Kundalini Yoga Teacher Training which I would finish in April. 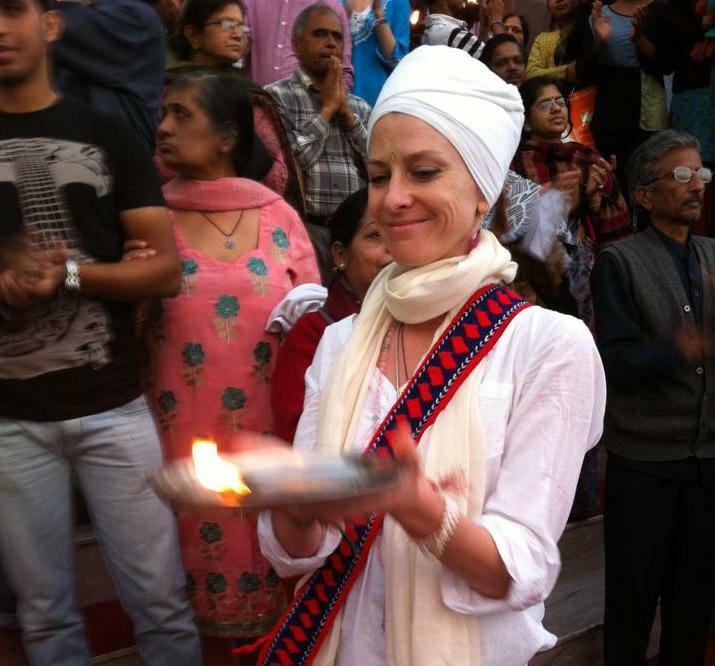 Already so much was transforming in my life, a true inner journey taking me back to my essential self and somehow I knew India was waiting for me to teach me so much more. Ever since I was a little girl I had a fascination for India. I would listen to Indian music, read spiritual books imbued with ancient wisdom originating from this country and of course since many years I am practicing yoga. India is the motherland of this sacred practice. India was calling me, calling me to return to my roots. So, I didn’t listen to my mind. I didn’t listen to the fear that translated itself into a fever in my body. I went ahead. I boarded that airplane. And believe it or not, about 10 minutes after take off the fever disappeared and felt so relaxed. Still excited, but in a happy way. I will never forget the first few hours on Indian soil. From the airport I went to the bus station to travel to Rishikesh. I had to wait until there were enough people on the bus before we could go. There I was, with my backpack, somewhere in New Delhi, sitting at a little chai shop, drinking tea. Not waiting for the bus, but realizing I was actually here, I am in India. That bus ride I was adopted by an Indian family who gave me food, tea and lots of love. The mother even gave me her bangles even though they were very poor. I didn’t feel far away from home, I felt at home. It’s hard to convey in words how it feels to be in a land where the devotion is almost tangible and so present in everything. Every encounter, every meeting is an opportunity to meet yourself and to rise above your own perception of the world. Being part of beautiful century old rituals right next to the holy river Ganga in Rishikesh took me to a new level of being. I will never forget the first time I entered the sacred space of the Golden Temple in Amritsar. The moment I climbed the stairs to enter the premises I had goosebumps all over my body, the vibration was so high. And then I saw the temple, heard the sacred chanting of divine words, it all went straight to my heart, which felt like it was bursting open and all I could do was cry. Again I felt, I am home. In Varanasi India showed me that death is such an essential part of life, which I could rationally understand somehow, but still. Death was all around. Not as something that happens behind closed doors, but right there in front of your eyes as actually the most auspicious moment of your whole life, to make the transition into the spiritual realm of being, shedding your physical body and returning home to the Source. Being here was a deep deep healing for me. It was here an Indian man told me: “You are an Indian Soul in a Western body.” I knew he was right. In February 2019 Tim and I will travel to India again and we invite you to come with us. Even though you might feel nervous about it, India is waiting for you to come home. We have only 2 spots left for this life changing journey of 18 days. If you feel called to allow India to be your teacher that will open your mind and touch your heart we encourage you to make that step, now. We promise you, you will never regret it!